The Office of the Tax Commissioner has advised that their online payment system has been enhanced to enable people to use their Visa, Mastercard and American Express to pay their payroll tax online. A spokesperson said, “The Office of the Tax Commissioner advises that the E-Tax system has been enhanced to enable tax payers to use their Visa, Mastercard and American Express for the payment of payroll tax. “This enhancement has been provided to give tax payers more payment options using the E-Tax system which removes the need for tax payers to wait in line. thank goodness I don’t have a credit card! Doesnt at all. 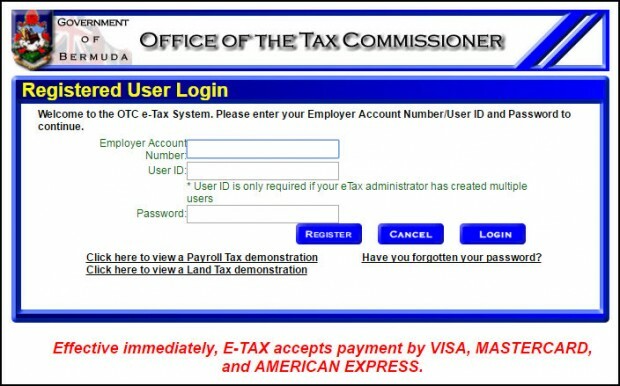 Also looks like it was made in 2004, like most gov websites. Fantastic! When can I use a Debit card to buy a ferry token? Why must I only use cash? Because the government don’t trust you. Finally. Welcome to the 21st century Bermuda Gov. Paid my company returns online but was told I was ‘filing without payment’ as the tax return sheet sent in the same day by the firm that handles my returns didn’t have a check attached.